The Marrakech Riads are a set of 4 perfect little boutique hotels resting in a magnificent setting full of splendour within the walls of the Medina in the exotic city of Marrakech. Each Riad has its own distinctive personality, with seven or fewer guest rooms to ensure truly personal service, and extras like breakfast served at the time of your choice, delicious evening meals individually prepared to your taste and dietary requirements, free Wi-Fi Internet access, and even the loan of a local pay-as-you-go mobile to stay in touch with your English speaking hosts while you are out exploring. Nothing is too much trouble! Getting to the Hotel: Marrakesh Airport is approximately 8 km from the hotels and airport transfer is available on request with charge. Local Tips: The hotels are in a perfect position to explore Jemaa El Fna Square, the Koutoubia Mosque, the city's monuments, and only a few minutes away from the new city and its trendy shops. 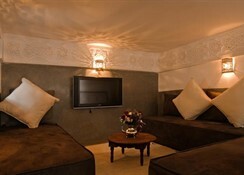 Marrakech Riads invite you to enjoy the delights of Morocco in affordable comfort! Please Note: Allocation of rooms will be completed on arrival. Dining: The Riads are booked as Bed and Breakfast accommodation. Each Riad offers breakfast served at the time of your choice, and delicious evening meals individually prepared to your taste and dietary requirements. A variety of dinners can be arranged through the Riad. Activities: There are dipping pools and terraces to enjoy in the Riads. Additional: 24-hour reception, complimentary map of the old town, help booking restaurants and excursions, multilingual Moroccan staff, loan of a local pay-as-you-go mobile, local room tax of GBP 2 per person per night payable directly to the hotel. 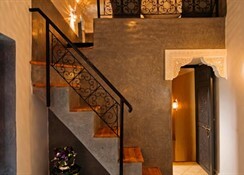 The Marrakech Riads features 4 perfect little boutique hotels: Riad Papillon, Riad Cinnamon, Riad Star, and Dar Habiba all painstakingly restored working with traditional materials and craftsmen while incorporating conveniences like iPod docking stations and Wi-Fi Internet access. 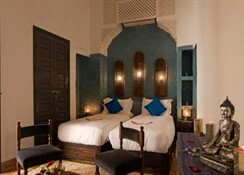 Riad Cinnamon has 5 suites that can accommodate up to 16 guests. It has en suite shower rooms, comfortable beds with luxury bedding, air conditioning, iPod docking station, personal safe, hairdryer, mini fridge, complimentary toiletries, luxury towels and robes, Satellite TV and other conveniences as well as an impressive cloistered patio with dipping pool. Riad Papillon has five beautiful guest rooms all superbly equipped with air conditioning, flat screen Satellite TV, mini fridge, safe, complimentary toiletries, towels and bathrobes, hair dryer and other modern conveniences along with a dipping pool, patio and fantastic roof terrace complete with sunbeds, dining areas and a Moroccan tent. 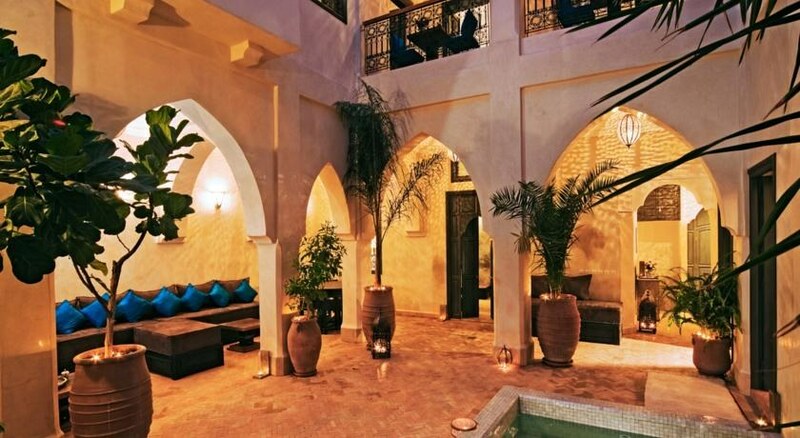 Dar Habiba is a traditional secluded Riad with one suite and five rooms sharing a romantic courtyard minutes from the famous Jemma al Fnaa square. Sleeps up to 14 people in total and rooms have an en suite shower room, Satellite TV, mini fridge and air conditioning. 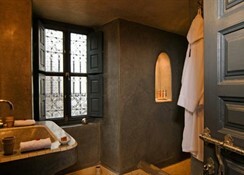 Riad Star is the newest and brightest Riad hotel in Marrakech. Jazz Age icon Josephine Baker lived here, the Riad is decorated with Music Hall memorabilia sourced from the Casino de Paris offering 7 luxury rooms for up to 18 guests. Rooms have luxurious 300 count Egyptian cotton bed-linen, sumptuous pillows, quality cotton white bathrobes and soft fluffy towels, mini fridge, a room safe, an iPod dock, Wi-Fi and in room Satellite TV.